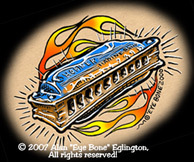 These days you can find me singin and waillin on Harp in Blues Cadillac (http://www.bluescadillac.com). But it was a long train commin to pull into that station! I first got into Instrumental Surf, Jan and Dean, and the Beach Boys, Then six months later the first British Invasion hit. When I got my hands on an AM Transistor Radio. I tuned in to KEWB Channel 91, from Oakland CA. They played the British Rock, but also lots of Chuck Berry, Bo Diddley, Little Richard etc. Thats when I started getting into Rock, Blues, and Soul, and I have been into them ever since. as long as its got the Blues in it! Ive sung my whole life. After disastrous attempts at playing Piano and Trumpet. I started teaching myself Drums when I was in seventh grade. By my freshman year in high school I was playing in my first "Garage Band". Along with the normal Garage Band fair, we mostly covered Santana and Quicksilver Messenger Service material. 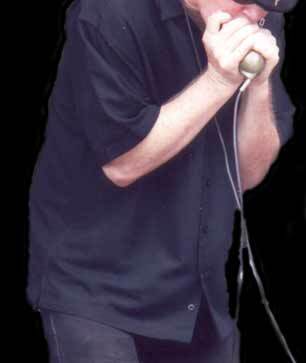 Later in high school I took up Harmonica because I was getting into Blues. I was listening to KMPX/KSAN and also KSJO. In those days they played a great mix of Rock, Blues, and Soul. They also played many local bands that folks were going to the local clubs to see live! Something I miss on today’s big radio. He also gave me my first harmonica lesson, and showed me the basics of slide guitar. I owe him big time! I played drums for twenty years, Then set them aside for ten years while I got serious about Blowing Harp! I started going to Local Blues Jams in Clubs like the Mountain View JJ’s, etc. Big Daddy Blu intelligently hosted many of the jams I attended. He put players together that would bounce off each other in a way that each would learn from the other, and most of us who wanted to improved because of it. Don't know where he is these day's but Thanks "Daddy!" Met lots of great folks like Danny Denaro (http://www.jumpinjukes.com/), and so many others I could go on for many long pages? I call those jam's "Blues School" and for all intents and purposes I paid my "Blues Performing Dues!" there! Something that I will plan to be doing for the rest of my life? Once you choose to commit to something when does the schooling stop? Ideally, not till you’re takin’ that eternal "Dirt Nap!"? At least I plan to keep learning and improving to the bitter end. These days you can still find me at many local, South Bay, and Mid Peninsula, Blues Jams. But most importantly I’m a proud member of Blues Cadillac (http://www.bluescadillac.com). One evening about four years ago, after finishing a jam at JJ's Blues on Stevens Creek Rd. in San Jose. I was heading out the door and Steve Welch approached me, we hit it off right away. He told me he was forming a band and invited me to a rehearsal. Long story short, I've been with Blues Cadillac ever since. The Cadillac’s current line up consists of: Steve Welch on Rhythm Guitar, Slide Guitar, and Vocals, Jerry Cash Lead Guitar and Vocals, Med Daugherty Drums and Vocals, Doug Mancini Bass Guitar, Chip Chiappari on Tenor Sax, and Ray Difazio on Baritone Sax. I play Harmonica and I’m one of the Vocalists. We also had the honor to play with three other great bass players as band members: Robin Hood, Charles Lions, and George Lacson. They each played with us a year apeice. I could go on for pages (see our web site for more: http://www.bluescadillac.com). Come on down! Book us in your club, or at your private party, then let us move you to dance your blues away!